I came across this article in Rolling Stone this morning (http://www.rollingstone.com/culture/news/heil-hipster-the-young-neo-nazis-trying-to-put-a-stylish-face-on-hate-20140623). The article explains how Germany’s neo-Nazis are using social media and appropriating popular hipster culture to spread their warped propaganda. So in Germany, riding a fixed-gear bike is akin to being a neo-Nazi. Jeesh, I don’t think so. Do these striking parallels mean that today’s liberals are genocidal maniacs, intent on conquering the world and imposing a new racial order? Not at all. Yet it is hard to deny that modern progressivism and classical fascism shared the same intellectual roots. We often forget, for example, that Mussolini and Hitler had many admirers in the United States. W.E.B. Du Bois was inspired by Hitler’s Germany, and Irving Berlin praised Mussolini in song. Many fascist tenets were espoused by American progressives like John Dewey and Woodrow Wilson, and FDR incorporated fascist policies in the New Deal. Fascism was an international movement that appeared in different forms in different countries, depending on the vagaries of national culture and temperament. In Germany, fascism appeared as genocidal racist nationalism. In America, it took a “friendlier,” more liberal form. The modern heirs of this “friendly fascist” tradition include the New York Times, the Democratic Party, the Ivy League professoriate, and the liberals of Hollywood. The quintessential Liberal Fascist isn’t an SS storm trooper; it is a female grade school teacher with an education degree from Brown or Swarthmore. What Goldberg very effectively does is to remove from the charge sheet the one possible reason any thinking person could have for not wanting to be right-wing: viz, that being on the right automatically makes you a closet fascist/Nazi scumbag. By accumulating a mass of historical evidence so extensive it borders on the wearisome, Goldberg comprehensively demonstrates that both Nazism and fascism were phenomena of the Left, not of the Right. The book, a New York Times No. 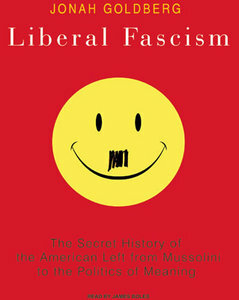 1 bestseller has, needless to say, enraged lefties (‘liberals’ as they’re more usually known in the States) everywhere. ‘In the first week I had half a dozen emails from total strangers saying, “How dare you accuse us caring liberals of being fascists!” and then going on to say what a shame it was that my family hadn’t been sorted out once and for all a few years back in the concentration camps,’ he says. One thing that unites Marxists, Nazis and Liberals is their belief in historical progress. The Marxists put their faith in a predicted worldwide proletarian revolution. What happened instead was a great war infused with the spirit of patriotism. The Nazis picked up on that and put their faith in the nation. When they lost, the Liberals put their faith in opposing the nation. Now that they are losing the jihad, the next stage for the Left is to put its faith in Allah. Another thing that unites Marxists, Nazis and Liberals is that they hate Catholicism. So, if you are a conservative and someone calls you a fascist or a Nazi, just direct them to theconservativecyclsit.com for a history lesson.